Item # 316681 Stash Points: 395 (?) This is the number of points you get in The Zumiez Stash for purchasing this item. Stash points are redeemable for exclusive rewards only available to Zumiez Stash members. To redeem your points check out the rewards catalog on thestash.zumiez.com. Show off your cultured art knowledge in paradoxical style with the Flying Coffin 20 Eyes Sticker. 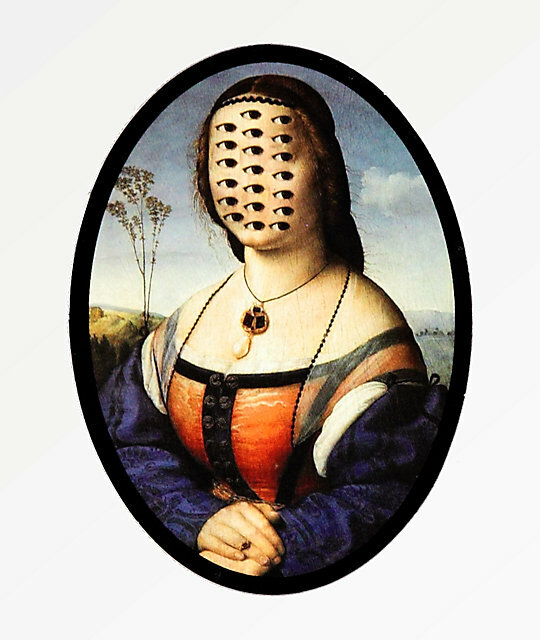 This sticker features an adaptation of an iconic painting with 20 eye balls in place of a face for a spooky look. 20 Eyes Sticker from Flying Coffin. Paradoxical art graphic with added eyes throughout the face. 4" x 3" &vert; 11cm x 8cm approx. diameter.